New York, NY (April 6, 2017) – The Institute’s annual Research & Innovation Symposium was held last night at The New York Academy of Medicine. The event allows Institute staff, of various disciplines, to share innovative research projects with colleagues, the community and Institute partners. 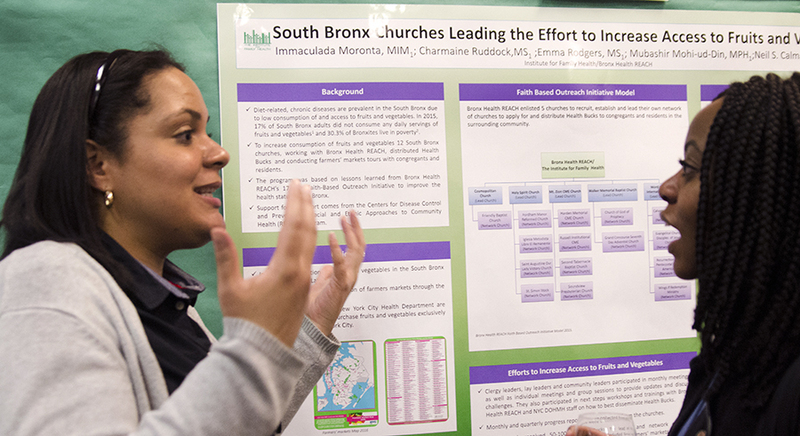 This year, Bronx Health REACH was the featured program of the evening. A display chronicled the program’s nearly 18 year history and program director, Charmaine Ruddock gave a speech highlighting some of the program’s most significant research and work to eliminate racial and ethnic health disparities in the South Bronx and beyond. It was an evening of discovery and recognition of the dedication, hard work and creativity of Institute staff who constantly strive to improve their services and develop new models of care, often even after the work day is complete. At the end of the evening, attendees voted for the best projects in four categories — Research, Continuous Quality Improvement, Innovative Projects and People’s Choice. Congratulations to all the Institute staff that participated in last night’s event.